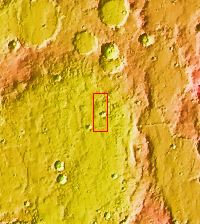 This VIS image shows a group of craters in Terra Sirenum. The apparent youngest one is the center crater with the scalloped rim. Subsurface tectonic features like faults can interfere with crater formation and lead to craters that are not completely circular. The linear fault features towards the bottom of the image are good indications that tectonic faults interacted with the impact event, resulting in the crater shape seen in the image.